WARSAW, Poland (AFP) — The museum at the former Nazi German death camp Auschwitz-Birkenau has acquired 18 post-war paintings by a Polish-French Holocaust survivor that depict the horrors of the gas chambers, and which will go on public display next year. 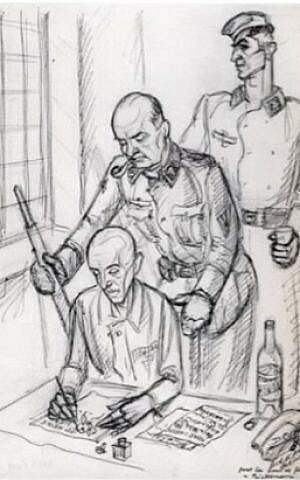 “Often in the paintings, we see the author himself, with a tattooed number on his arm, as a prisoner of the Auschwitz camp, who with his own eyes saw the process of the extermination,” museum art historian Agnieszka Sieradzka said in a statement on the site’s web site. The late Jewish artist, David Olere, was born in 1902 in Warsaw. He studied at the Academy of Fine Arts before leaving for Berlin and finally Paris, where he worked for Paramount Pictures, Fox and other film studios by designing posters, costumes and set designs. A few years after becoming a French citizen, Olere was arrested by French police in 1943 and sent to the Drancy camp and then onward to Auschwitz as inmate number 106,144. There, the Germans forced him to work in the Sonderkommando, a unit charged with collecting and cremating the bodies of prisoners killed in the gas chambers. 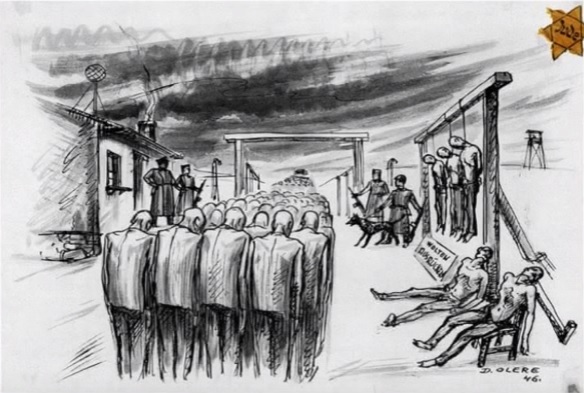 “David Olere is the only prisoner of Sonderkommando who transferred his traumatic experiences from the shadow of the crematorium chimneys on paper and canvas,” museum director Piotr Cywinski said in the statement. Thanks to the Polish culture ministry’s purchase of the 18 works of art, the museum at Auschwitz-Birkenau in the southern Polish city of Oswiecim now has the world’s largest collection of Olere paintings. Several others are located at the Yad Vashem holocaust memorial center in Jerusalem and owned by private collectors. 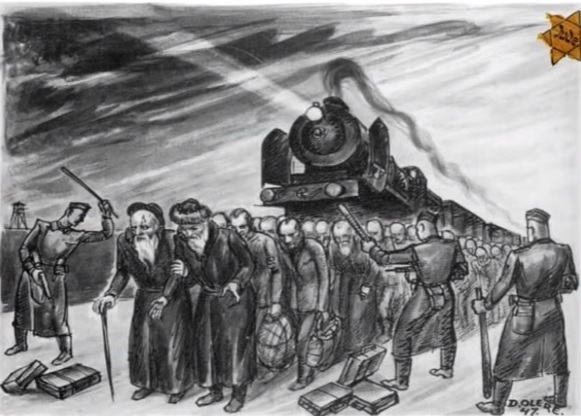 Dozens of Olere’s black and white sketches are also part of the collection of the kibbutz Lohamei Hagetaot in northern Israel, according to Cywinski. Olere died in France in 1985 at the age of 83. His grandson is helping the museum organize a temporary exhibition of the paintings in 2018, according to the statement. 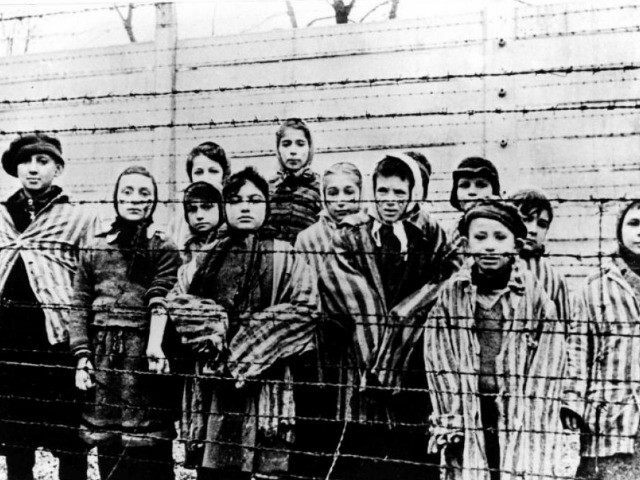 Nazi Germany built the Auschwitz death camp after occupying Poland during World War II. The Holocaust site has become a symbol of Nazi Germany’s genocide of six million European Jews, one million of whom were killed at the camp between 1940 to 1945. More than 100,000 non-Jews also died at the death camp, according to the museum. An estimated 232,000 of the victims were children.